Preserving the amount of the Cohesion policy and the Common Agricultural Policy (CAP) is the absolute priority for the new EU member states in the negotiations on the next Multiannual Financial Framework (MFF) 2014-2020 of the Union. This has once again become clear at the conference "Bulgaria and the EU Multiannual Financial Framework 2014-2020", organised by the Economic Policy Institute in Sofia. 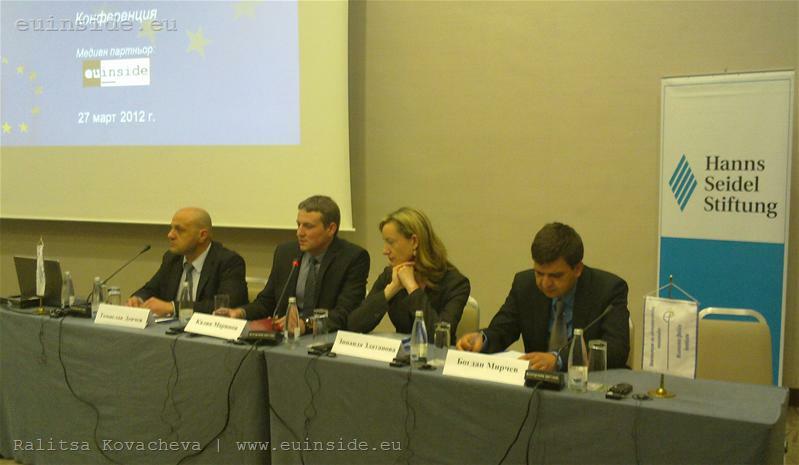 euinside was a media partner of the event. Besides Bulgaria also Hungary, Romania and Poland presented their positions on the MFF. 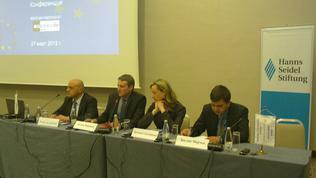 The Bulgarian position was presented by Tomislav Donchev, minister for EU funds management. He formulated three main tasks of the Bulgarian government: to participate in the MFF debates with concrete proposals and positions; to define the national priorities by 2020 (the "Bulgaria 2020" strategy will be finally adopted in July); and the biggest challenge - the actual process of programming - should be completed by mid-2013. As the most significant changes in the cohesion policy Minister Donchev highlighted the focus on results and using the policy as an instrument of macroeconomic stability. We already have the first case of sanctions by suspending cohesion funds - Hungary may be deprived of half a billion euros if it does not take action to correct its excessive deficit. Bulgaria supports the introduction of macroeconomic conditionality, but among the member states, regardless whether new or old, there is no agreement on the issue. During the conference Romania once again strongly argued against suspension of cohesion funds as a penalty, and according to Poland macroeconomic conditionality needed "significant improvements". Like Bulgaria Romania, Hungary and Poland also strongly oppose potential reduction of funds under the cohesion policy and the CAP. Hungary and Romania once again opposed the 2.5% of GDP capping for cohesion allocations. Last year, Bulgaria, through the Ministry of Finance, also expressed a position against capping, but then suddenly stopped commenting on the matter. Minister Tomislav Donchev told euinside recently that even with a ceiling of 2.5 percent in the next programming period Bulgaria would receive more funds than under the current period. It also became clear, that although supporting the new Connecting Europe Facility (for large infrastructure projects) proposed by the European Commission, the new members oppose it to be financed with 10 billion euros (of a total of 40 billion euros) from the cohesion funds. The new member states, however, are not united in their attitude towards the newly created category of "transitional regions" that are entitled to receive funding under the Cohesion Policy. Those are regions that have surpassed the level of 75% of GDP of the EU average (poor regions), but have not yet reached 90% of GDP of EU average (developed regions). Bulgaria does not oppose the transitional regions to keep receiving cohesion funds, provided that this is not at the expense of the poorest regions. For Hungary reallocation of funds from poor regions to transitional regional is unacceptable, while Poland insists that the transitional regions need special support. With regard to the CAP, all new member states insist the direct payments to be levelled to those in the old member States. In this respect the Polish position could serve as an example, because it focuses on the Rural Development Programme as a way to achieve greater efficiency of the CAP. The strategy "Bulgaria 2020" also sets a priority to modernise agriculture in order to achieve higher efficiency and productivity. On the revenue side, as you know, Bulgaria has already expressed a negative stance on the introduction of a financial transaction tax (FTT), but as it turned out at the conference, the country is not against the tax to be used as an own resource in the EU budget. More on this topic you can read here. The official silence on the issue continues, while informally there is talk of some softening of Bulgaria’s position against the FTT - not because the country has particular reasons to support it, but rather because it has no good reasons to oppose it. This is also the view of the Economic Policy Institute’s analysts, who believe the tax would not affect negatively Bulgaria. Rather, their concerns are associated with the proposal for a new VAT-based own resource, which will take away a share from member states` tax revenues, because VAT forms a significant part of tax revenues in Bulgaria. Another problem is the existence of a differentiated VAT rate in some countries. On this issue, Poland clearly expressed support for the introduction of FTT and the new VAT-based own resource, but opposed any correction mechanisms in the revenue side of the budget. Corrections exist because some countries are net payers and pay to the EU budget much more than they receive. The Commission`s proposal is the system of corrections to be simplified and made clearer and more transparent. The Economic Policy Institute is preparing a special study on the next MFF and the new member States. It will focus on the evolution of the own resources system of the EU and changes in the CAP through the eyes of the new member states - Bulgaria, Poland, Romania and Hungary.